The Liverpool manager has had his say ahead of Liverpool’s clash with Tottenham at the weekend. JURGEN KLOPP SAYS the priority for Daniel Sturridge is to be in a “finishing position” after the striker complained about being used on the wing. Speaking after a 5-0 League Cup win over Burton Albion on Tuesday, Sturridge expressed his frustration at not being deployed at centre-forward, having toiled on the flank in a surprise 2-0 Premier League defeat to Burnley last weekend. Klopp, addressing the media ahead of the match away to Tottenham on Saturday, offered a reminder of the need to balance all of the demands presented by his attacking options, which include Divock Origi, Roberto Firmino and new signing Sadio Mane. “First of all, you have to think a little bit about why you ask things like this,” he told journalists. We need to find a formation where players can start. I don’t want to play Daniel as a wide player, but he can play there. “But winger is not a fixed position, especially not in Daniel’s case. It’s not like you play there and say wait until something happens. It’s flexible football. “In the key moments he needs to be in the finishing position. We still have to work on a lot of things. I don’t know exactly what he said, but we have talks. Tottenham began the season by drawing 1-1 draw at Everton, followed by a 1-0 victory at home to Crystal Palace, with Klopp claiming Spurs are yet to produce their best football in 2016-17 despite that steady start. “This is a new season and there’s a lot of expectation,” he said. “That’s how it is. The summer break is good when you have time to work together. But you need to find rhythm. “We all can improve and I would say the same for Tottenham. Liverpool and Tottenham are both teams with consistency in the squad, not too many changes. They are strong. According to Klopp, Emre Can (ankle) and Origi (cramp) are doubts for the match at White Hart Lane. Email “'Daniel can play there': Klopp and Sturridge on collision course over attacker's position ”. 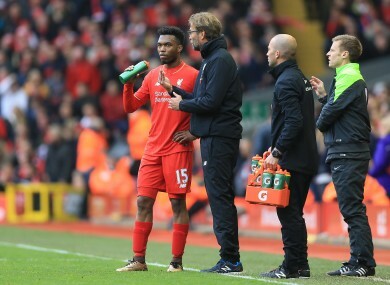 Feedback on “'Daniel can play there': Klopp and Sturridge on collision course over attacker's position ”.